Pure pearl mala, 24 inches in length (each bead is around 8 mm in length). The beads are naturally formed and will have many variations, all generally oval in shape. Wearing the pearl mala has a cooling effect on the mind and body. 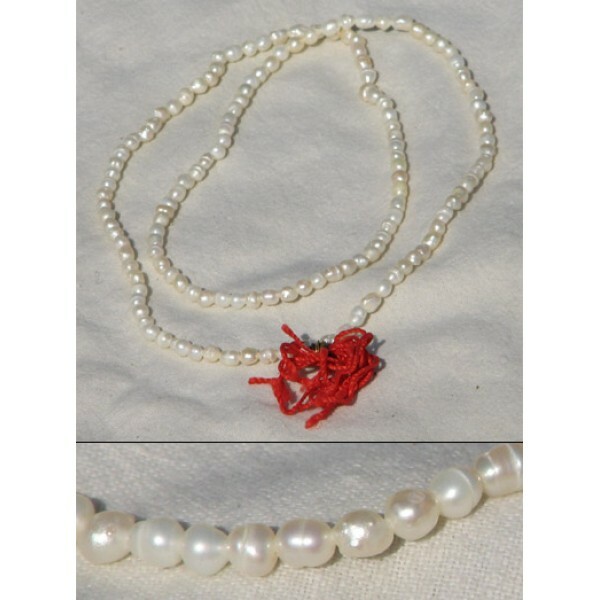 The pearl mala is also recommended for use when performing japa of Devi mantras (particularly Saraswati and Bala). Pearl is associated with various forms of the Goddess. It inspires creativity and brings wealth. It's effects are soothing and cooling. It's related planet is the Moon, and its related element is water. We sell only 100% pure authentic malas of the highest grade. Be very careful of duplicates when purchasing sphatika, rudraksha and pearl malas.